The Goldtouch keyboard has, in some form, been a standby of ergonomic arsenals for almost twenty years. Its flagship feature is infinite adjustability to match the needs of individual users. There’s no separation between the halves, but you can do splay, tenting, and just about anything else you like with the Goldtouch. The Goldtouch V2 keyboard in a typical operating position. As keyboards go, the Goldtouch has an interesting story. Its original version was developed in 1992 by a manufacturing trio that included Lexmark and IBM. It was marketed as the Lexmark Ease M15 . In an era when boring beige keyboards ruled the land, the M15 sported an innovative ergonomic split design similar to the Goldtouch of today, only with a round adjustment knob in the center instead of a handle on the side. That round knob seems to have been the keyboard’s Achilles’ heel. The few that didn’t break are collector’s items today, regularly fetching over $600 on eBay – one pristine unit actually brought more than twice that – for a keyboard that cost less than $200 brand new. After the M15 was discontinued in 1997, Goldtouch brought its own version to market – with a much-improved pivot locking mechanism, thankfully. Goldtouch reached another milestone this year in the second major version of the keyboard design, the newer, cooler V2. It was this second-generation board that I received when I contacted Goldtouch for a review sample. “If it isn’t adjustable, it isn’t ergonomic.” The Goldtouch motto sums up the point of the keyboard. No one operating position is right for all users, or even for most users. In addition to obvious physical differences of body size and shape, people have varying preferences and perceptions. The setup I find ideal, for example, doesn’t work for my brother, and his “perfect” position, in turn, does nothing for me. On most ergonomic keyboards, the biggest adjustment you can make is to snap out the tilt feet. Beyond that, you’re stuck with a fixed position that’s supposed to help reduce the risk of RSI for the Average User. Goldtouch has never heard of the Average User. Their keyboard is designed so that you can put it in a theoretically infinite number of positions – and have it stay there. 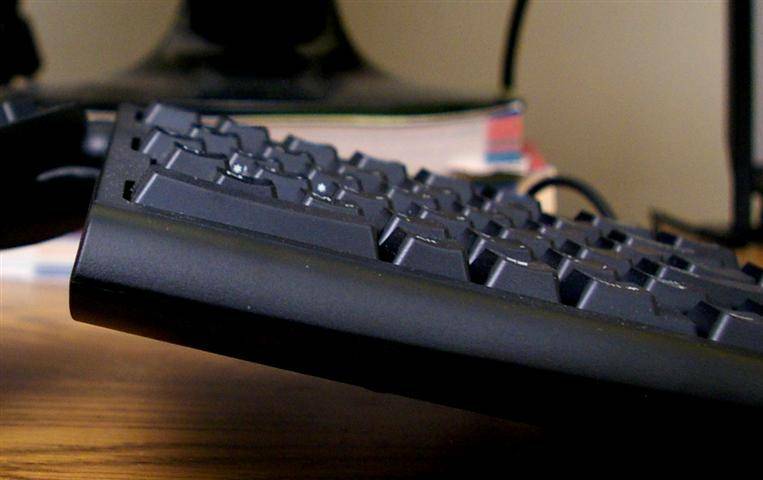 The two halves of the keyboard are connected by a locking ball joint. You release the ball joint using the large handle on the left, then lock the keyboard into a new position by cinching down that same handle. Rather than trying to do the whole adjustment process at once, Goldtouch recommends that you start out by using the keyboard in the straight position for a while, to get the feel of the keys and layout. From there you can move on to splay when you’re ready, keeping the keyboard flat but creating an angle between the halves. Once you’re comfortable with that, it’s time to experiment with tenting, raising the middle of the keyboard higher than the two sides. At the end of this adjustment process, you should find that your keyboard is in the ideal position for your particular body type and requirements. The Goldtouch keyboard can be set in an infinite number of positions using a locking-lever ball joint. The Goldtouch ball-joint system looks somewhat difficult to adjust, a fact on which competitor Kinesis effectively played in the third scene of this very funny video. Marketing mirth aside, I find the Goldtouch keyboard easy enough to adjust, with an asterisk: The locking handle does require reasonable hand strength to manipulate. 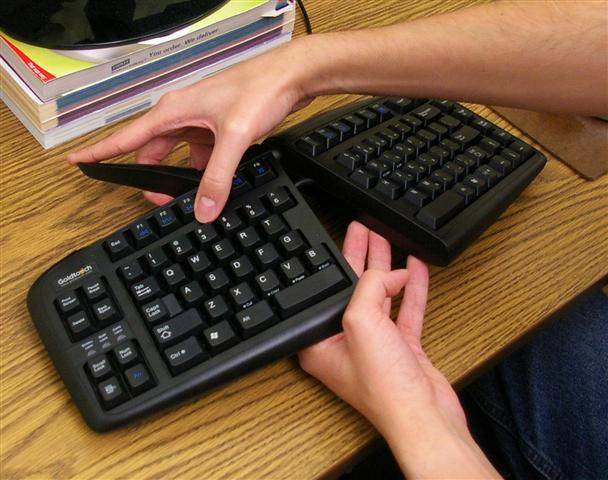 Some people will want to use the buddy system – one to hold the keyboard in position and one to work the handle. This shouldn’t be too much of a problem since the keyboard only needs to be adjusted once. You do need to watch your fingers when snapping back the handle. Even a minor pinch from that much force can hurt. The keycaps on the V2 are more deeply “cupped” or indented, resulting in reportedly greater comfort for some users. 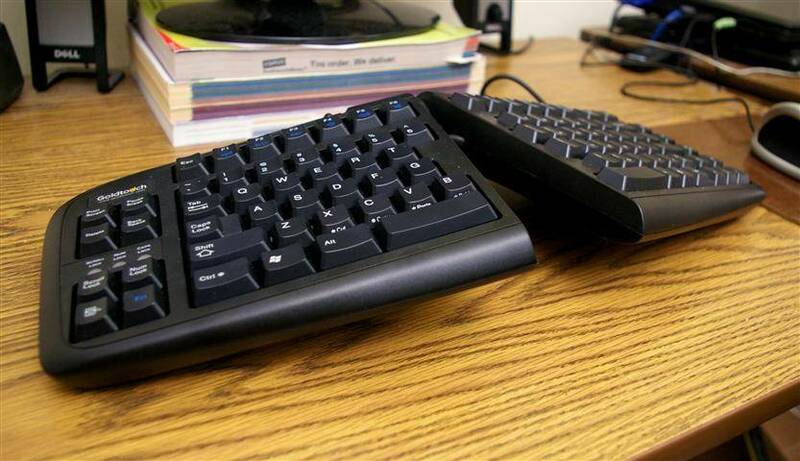 The Goldtouch keyboard uses membrane, or rubber dome keyswitches, putting it in a separate class from the more expensive mechanical keyboards such as the Kinesis Advantage. Not all rubber dome keyswitches are created equal, and the ones used on the Goldtouch are better than most. Where garden-variety membrane keys are often mushy and hard to press, the Goldtouch keys are light, soft, and springy. Making no effort to imitate the clicky feel of mechanical switches, they instead play to the advantages of membranes, with a gentle feel that makes pressing each key seem less like work. A few external numeric keypads, such the Tevion model sitting on my desk, won’t work in conjunction with the Goldtouch because they require Num Lock to be engaged. If you turn on Num Lock while using a Goldtouch keyboard, you will activate not only the external keypad, but also the embedded numeric keypad, which will make normal typing impossible. According to Keyovation, only the Tevion and Loglink brand keypads have this issue – so be sure to get another type, such as the keypad offered by Goldtouch itself, in order to avoid problems. With the ultra space economy of serious ergonomic keyboards, media control keys don’t usually make the cut. The Goldtouch V2 shows its trendiness by including all the standard media control keys, plus the less-useful Email, Calculator, etc. as options on the F1-F12 row. You have to hold down Fn at the bottom left to access these alternate keys, but it still beats diving for the volume knob or the Windows system tray. As a completely inconsequential side note, I’m almost sure the “Email” icon on the F8 key is upside down – unless it’s supposed to be showing an open envelope with the flap ripped off. Always interesting to see the peccadilloes that make it through quality control. On the left is the Goldtouch email icon on the F8 key, compared to the same icon on a Logitech keyboard. Notice how there’s something odd-looking about the Goldtouch? When I used my first computer keyboard in 1997, it was months before I noticed that there were these interesting fold-out “feet” along the back. If you listen to ergonomists, I would have done better never to have noticed them at all. Rear keyboard feet are the pet abomination of most ergonomic professionals, because they make our wrists bend backward, which position tends to produce injury rather than prevent it. 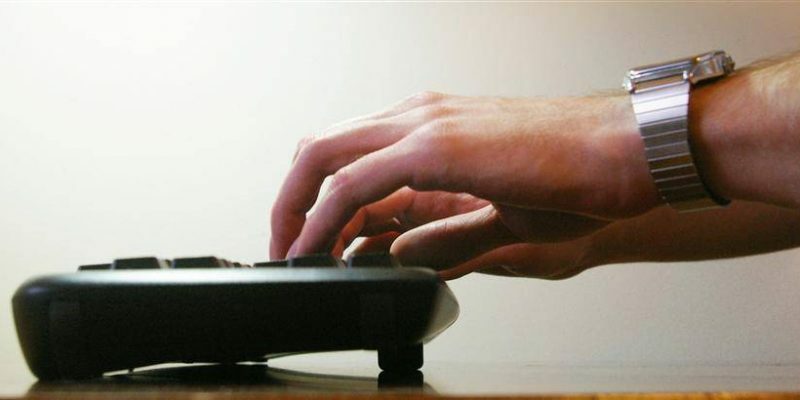 In recent years, conventional ergonomic wisdom has gone a step further, indicating that the keyboard shouldn’t even be dead-level – it should actually be tilted away from the user, with the front higher than the back. Goldtouch pays homage to this new wisdom with a pair of fold-out front feet. Extended on a flat surface, these feet will raise the front of the keyboard somewhat less than an inch, producing a moderate negative tilt. If used properly, negative tilt can result in a more natural wrist position. The Goldtouch implementation, however, leaves something to be desired. Negative tilt is great, but a couple things about the Goldtouch implementation puzzle me. The feet lack the rubber friction pads found elsewhere on the unit, which means that this keyboard can go slip-sliding away right in the middle of whatever you’re doing. You can address this problem with a couple of rubber bands laid flat, but really? A brand new design and no friction feet? Also, the tilt feet are very near the middle of the keyboard. Maybe this is necessary because of the splay feature, but it makes the outer edges wobbly to type on. I may be wrong, but the whole negative tilt feature feels to me like an afterthought. Up to now, Goldtouch has offered two versions of their keyboard, one for PC users and one for Mac. But what if your Mac croaks and you buy a PC, or vice versa? What if you’re ordering 200 keyboards for an office with a constantly shifting mix of Apple and Windows? The answer is the GTN-0088, a soon-to-be-released version of the new V2 keyboard. This new model will cost $10 more than the plain V2, and will be able to change between Mac and PC with the flip of a switch. Plus, the GTN-0088 will have additional feet on the bottom for elevating the entire keyboard to level with certain palm rests. Not bad for a $10 upgrade. I like the Goldtouch. It’s an incredibly adaptable keyboard with creamy key action, narrow footprint, and a smart layout. The one thing it lacks is the ability to separate the two halves completely. If that isn’t a feature you care about, by all means – go for the Goldtouch. Disclosure: This review was made using a complimentary sample from Goldtouch, which I gave to another person after finishing the review.